This past Saturday March 21, some H4H members met at a restaurant and listened to some very inspirational individuals speak about traveling abroad. These individuals all have experienced a calling from God to help make a difference. The importance of every individual’s calling was stressed greatly. Our calling as a club is to bring relief services and spread awareness of typhoons in the Philippines. Every speaker was very inspirational and has had amazing experiences that they shared with our team! Thank you to all who spoke to us and shared your stories about travel, life and your calling from God. It was truly a gift! Every individual has his or her own calling, what is yours? Have you ever thought about traveling abroad? 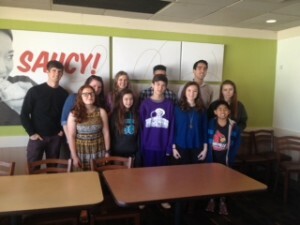 Below is a picture of our club and the speakers. When I think about our economy vs the Philippine's economy, I feel grateful for the small economic stability we have in the United States." As 2015 begins, there is another typhoon season approaching in the Philippines. An annual cycle of winds causes most typhoons to develop between May and October. In the northwest Pacific Ocean, two different agencies exist to assign names to typhoons. This often results in the tropical storms having two names, like Haiyan/Yolanda. But why are they so different? One of the agencies is the Japan Meteorological Agency, or JMA. This agency will only name a typhoon if it has wind speeds of at least 65 km/h (or 40 mph) for at least 10 consecutive minutes. This applies to storms which move into or develop anywhere in the Pacific typhoon basin. Tropical cyclone names are chosen from a set of five lists of names set by the JMA’s Regional Specialized Meteorological Centre in Tokyo once the storm reaches tropical storm strength. Members of the ESCAP/WMO Typhoon Committee contribute the names. Each of the fourteen nations in the Pacific Typhoon Basin submit ten names, which are used in alphabetical order but the official English name of the country. 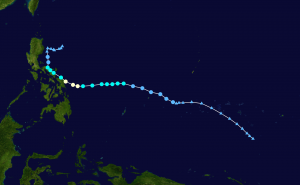 The next tropical storm to be named by the JMA will be Bavi. The other agency, the Philippine Atmospheric, Geophysical and Astronomical Services Administration, or PAGASA, will assign names to tropical storms which move into or form only in their area of responsibility. This agency will name a typhoon regardless of whether or not it has already been named by JMA, as the agency has its own naming scheme. PAGASA assigns names to tropical depressions from a list of names for the year, in alphabetical order. The next tropical storm to be named by the PAGASA will be Betty. A tropical cyclone can be labeled any of four divisions, depending on its wind speeds. A Tropical Depression has wind speeds of less than 62 km/h (or less than 39 mph). A Tropical Storm has speeds of between 63 and 88 km/h (or between 39 and 54 mph). A Severe Tropical Storm has wind speeds of between 89 and 117 km/h (or between 55 and 73 mph). A Typhoon is the highest and most dangerous label for a tropical cyclone, having wind speeds of over 118 km/h (or over 74 mph). Though typhoon season isn’t scheduled to start until May, the Philippines has already been affected by typhoons. In January, a Severe Tropical Storm, named Mekkhala/Amang killed two people and made an airplane crash in Tacloban, although no passengers were killed in the incident. It also disturbed Pope Francis’s visit to the Philippines because of a decision to travel from Tacloban to Manila four hours ahead of the scheduled time. 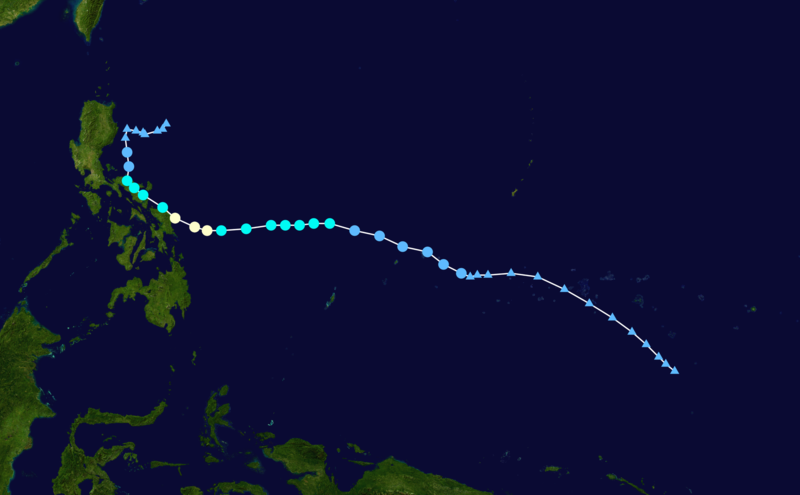 Severe Tropical Storm Mekkhala/Amang’s path in the Philippines. In February, Typhoon Higos became the strongest February typhoon on record and the easternmost forming Pacific typhoon. Thankfully, it did not cause any significant damage over any islands. Higos was not named by the PAGASA because it did not enter the Philippines’s area of authority. In my fourth grade class, I recently learned how important water is for both plants and animals. Water is a NEED. Without water, living things would die. It is interesting to find out how water is transported in the Philippines. In some places people have to purchase clean water from a water shop. Imagine that!